Decadent chocolate cake by Miss Yui @ The Golden Triangle Cafe. Eating as a kid – in the beginning, there was sugar. My brother and I pretty much had free range over the foods we wanted. But not in a “Do you want sushi or beef wellies?” kind of way, more like we rode the shopping cart down commissary food aisles with reckless joy throwing in Twinkies, Ding Dongs, and Ho-ho’s – kind of way. We enjoyed our junk food and took full advantage that our immigrant mom didn’t know any better. I’m also sure she wanted to give to us what she didn’t have as a child in rural Thailand. My mom is chubby, but I never saw her starve herself (she grew up too poor for that nonsense) to lose weight or reject food. She’s not a picky eater. She’s very good about trying new foods, actually. In fact, I was the picky one growing up, but I got over it (young parents rejoice). So, I think she was a good food role model. Despite growing up working class, we ate a good balance of packaged conveniences and healthy foods. Thankfully, my mom cooked often, grew herbs and fruit in our yard and didn’t put crazy restrictions on what we could and should eat. Of course, she admonished me for not eating enough vegetables or eating too much junk, but she wasn’t strict and I think this has helped me have a balanced palate. 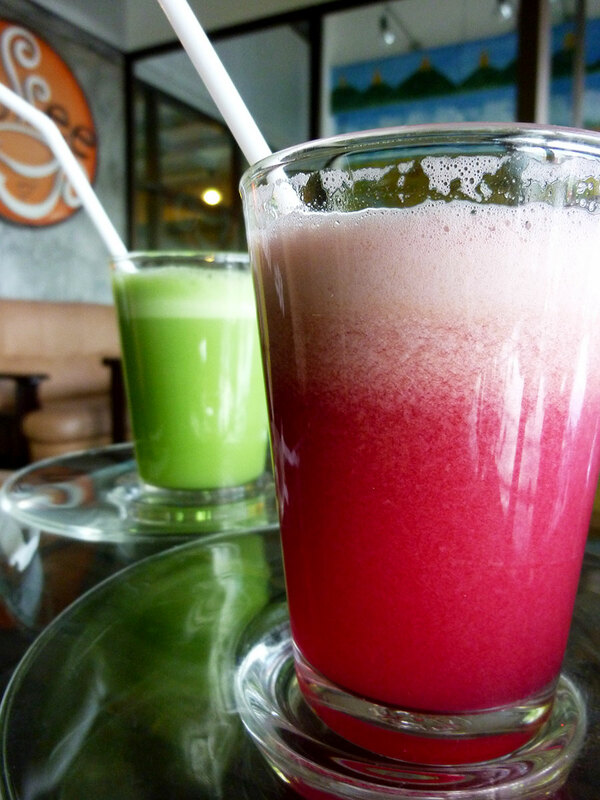 Freshly juiced at Coffee Plus (the Salad House). Dieting fails – dairy is the devil. When I was in high school, I eliminated butter and mayo from my diet to see if I could be skinner. I was briefly obsessed with being skinny and quickly caved because I like fats. I don’t know what I was thinking. I was probably reading too many fashion magazines at that time. During my 20s I was a vegetarian for a year until I realized how bad I was at finding protein and better ways to feel full. Before that I was on a 75% raw food diet because a friend of mine convinced me that cooked food was evil. When I was dating that MMA guy, I didn’t eat pork because he convinced me that pork was evil. But generally speaking, I haven’t restricted myself. I suppose that might sound like a contradiction, but I guess I see food restrictions as painful choices and my decisions have been relatively easy because I know how important my health is. When I do restrict myself it is when I know my eating habits have been out of balance. In other words, I need to cut down on meats or sweets. Climbing Mt. 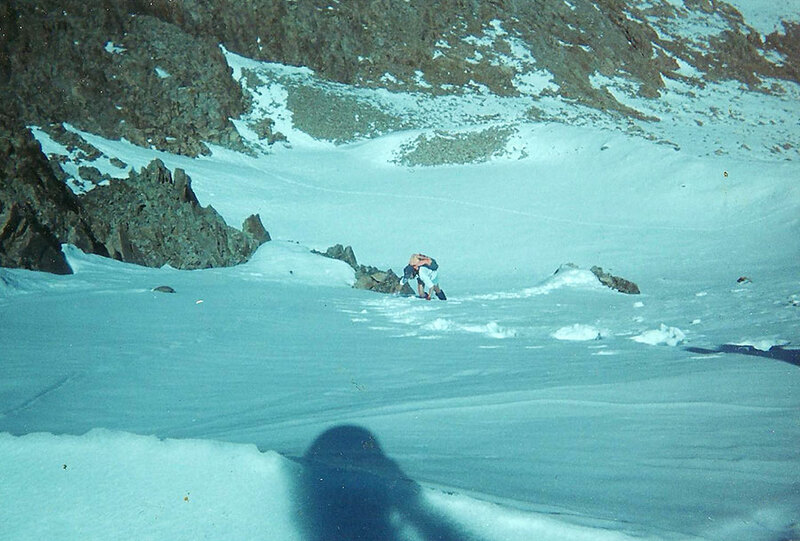 Babcock (13,018 ft / 3,968 m), Colorado, circa 1996. College – I miss my mom’s cooking. There is nothing like being taken out of your eating element to make you realize that yes, you like food a certain way and that you have your particularities. I didn’t recognize how lucky I was to grow up around great food until all that good food was no longer available. You see, my mom is an accomplished cook. I was eating Thai food before it was trendy (sooo needs to be a t-shirt). And I grew up in Hawaii, which not only has amazingly perfect weather, but excellent dishes from all Asian ethnicities under the rising sun. So what happened? Well, I wanted to go out of state for college, and being the “I’d rather walk in the woods then lie on the beach” type, I fell in love with Colorado. Now, for those of you who are not familiar with this Rocky Mountain State, it’s colder than Hawaii – and it snows. But I thought you were talking about food, Lani? Yes, and this is related because there was not much in the way of Asian flavors in the little podank town of Durango, Colorado. Of course, we had the Golden Dragon which was like eating Chinese food from the frozen food aisle. I gained weight during my first year away because I was freezing cold and starving for good food. During cafeteria hours, I’d watch my roommate’s friend Rachel carefully weigh her food on a little white scale then later I would order pizza or subs because the school food was so horrible. My mom sent me Top Ramen and Cup ‘o Noodles. I thought I was going to die from the lack of edible food. I didn’t die, but I got really sick. I blacked out on the toilet (always a good place to lose balance and sight). A cyst formed on the back of my neck that has never completely gone away, and makes appearances when I’m sick… So I went to the school doctor and found out I was slightly anemic. I also received a bizarre checkup that involved the good doc putting his hands down my pants to see how my other glands (some sort of lymph nodes) were fairing. I never went back. And even though my first year was the unhealthiest I had been, I never been that unhealthy again. Thank god. My roommate and I moved out of the dorms into an apartment and I learned how to cook. And this was the beginning of better eating and my adult relationship with food. Cooking for myself – I can cook? Despite cooking setbacks like when I burned rice (uh, what kind of Asian burns rice?) or when I mistook salt for sugar for my chocolate chip cookies (we were high), I actually enjoy cooking for myself and others. I learned a little from watching my mom, but not as much as I should have because when I was younger I’d rather be reading a book rather than learning how to cook. So, in college, I learned how to do some basic Mexican and Italian cooking from my roommate. Then, I started to get into cookbooks like Betty Crocker, finding and trying recipes and eventually subscribing to food magazines. Baking became a novelty because I didn’t grow up in a household that used the oven, except for Thanksgiving turkey or storing pots and pans. And because I still have that serious sweet tooth, baking became a way to feed my need for sugar in a variety of confectionary ways. At my worst (best? ), I was baking cookies every night. I was also saving money and controlling the food I ate. Eating out in the US is expensive and the portion sizes are waist-ful. I think cooking at home makes you very conscientious of what you buy at the grocers, how much this or that costs and it’s much easier to reuse leftovers than reheating takeout that may or may not have retained its taste. Eating overseas – Where’s the beef? My best friend who also resides in Thailand occasionally braves eating like the local, which means plopping himself down and ordering something new. So, on fine afternoon, he ordered “Yen ta fo”, and was soon awarded with a hot bowl of cubes of blood, octopus tentacles, fish balls, noodles and anomalous bitter vegetables. And since he does not like food to go to waste, he gulped down as much as he could. Eating overseas (especially someplace like SE Asia) can truly be a gut-twisting experience because the food is so foreign. Yes, I had the advantage of recognizing some of the food from my mom’s kitchen, but there were plenty of surprises in store for me. I also had the experience of dating a person who hadn’t been exposed to Thai food and his “food culture shock” reactions were interesting. He started to eat at McDonalds and stick to one or two Thai dishes that he liked. He lost weight and has yet to gain weight back despite learning to eat a variety of Thai foods. But when he was first acclimating, I don’t think he acted differently than other expats who are not used to the food here. The smells, sanitation (or lack thereof), salt to sweet ratio with main dishes versus desserts and so on, hit you like a tide you didn’t expect. We started to look at the food back home differently. American food is calorie dense. Portion sizes in Thailand are tiny in comparison. Quality beef is rare, expensive and usually tough, overcooked or buffalo meat. Diarrhea and food poisoning are commonplace. Frogs, snakes, critters and other creatures are writhing and twitching at the market for you to stare at. It feels like you are on another planet and so you reach back for what you recognize and know. I can’t begrudge tourists or expats for eating Western food. I certainly crave pizza, pasta, sandwiches and things I can’t even remember anymore. I love this quote, “We travel to find something new, only to seek out the comforts of home” because it’s so true. I think food (not unlike friends) make us feel at home, welcomed, and connected. So when we don’t like the food, an integral part of the expat or travel experience falls flat-footed. 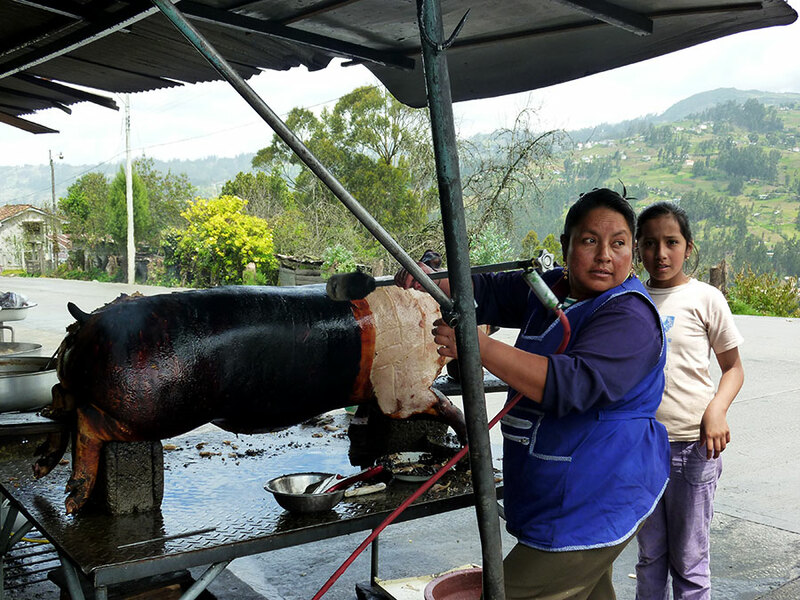 When I lived in Ecuador, I did not enjoy the food very much. It seemed bland. Often, I felt gassy, bloated and unhealthy despite walking quite a bit. Living abroad has definitely open larder horizons that never would have occurred had I stayed in America. So in that sense, I feel my connection and appreciation for food has grown. Food is incredibly personal and cultural and it’s fascinating what we eat. I’m not as picky as I was when I was a child, but I definitely have a tongue for: salty, sour, bitter, sweet and savory. When I think about the culture surrounding food, the haves versus the have-nots, and how much food has changed (profits over people), I’m grateful that I have never experienced real hunger, I have healthy food choices and my relationship with food has been, overall, a balanced one. What about you? What is your relationship with food like? Previous Post Why do guys like crazy girls? I can really relate to you. I grew up in Hawaii, but I didn’t like fruit and seafood! My friends and family think I’m crazy. But now, I enjoy fruits and I like fish, too. Sushi, oddly enough, got me liking fish but I don’t like lobster or shrimp and those other sea creatures. Yeah, and as far as living in Thailand, I can get most of what I want or miss. I can make it or chances are someone else is going to make it so I can buy it. For example, today is the big American holiday, Thanksgiving. And even in small town Chiang Rai, I can find a place that will serve a Thanksgiving meal. *shyly raises hand* That would be me, Ma’m…. It’s interesting you mentioned that you grew up in a household that didn’t used the oven too much. That was the same with me, and perhaps it’s so for quite a few other Asians too, except those who bake. The only time I saw my mum using the oven was when she baked frozen battered fish, which she rarely did. I’m not much of a cook. I tend to boil rice on the weekend for the rest of the week and make sure there are fresh slices of chicken and cut-up veggies in the fridge. Less time to prepare and wash up, more time for rest. Hahahaha! 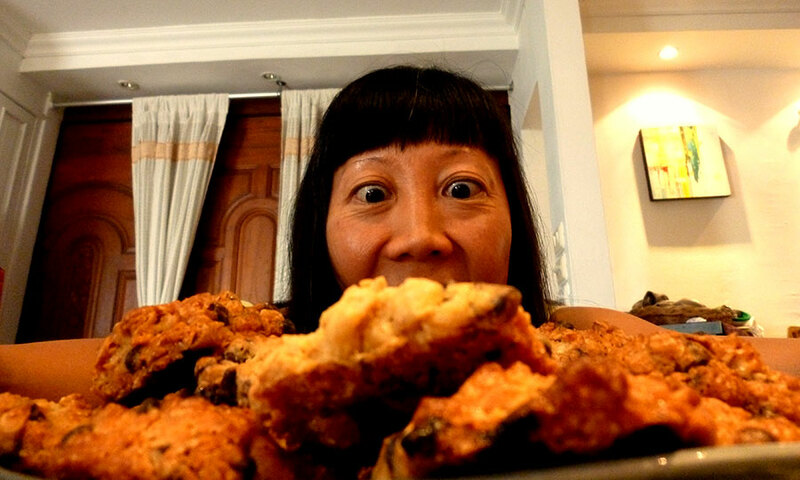 That’s an old picture of me with a freshly baked batch of oatmeal chocolate chip cookies! I like my butter, so that is why it looks crispy (soft in the middle though!). You may not be much of a cook, but you are definitely a “plan ahead” cook. That’s actually very smart and budget conscious. Eating out in Thailand is affordable, so we eat out often, but I still like to cook so we eat at home, too. Oh dear, how embarrassing. Cookies. But they really look like chicken 😀 I love oatmeal chocolate chip cookies – love how chewy they usually are. I’m not sure whether you have already known this or not. However, red soup in Yen Ta Fo doesn’t come from blood but it is from Red Tao Hoo Yee (not sure how to explain about Tao Hoo Yee but it is food ingredients made by Tofu). If someone wanna ear noodle with blood soup, they will go for Nam Tok when ordering pork/beef noodle. We will order in Thai like Sen Mee Moo Nam Tok (Pork) or Sen Mee Nue Nam Tok (beef) : Sen Mee is very narrow white noodle. It’s funny because for me, eating the blood in a broth of soup (i.e. boat noodles) doesn’t bother me. But when I see chunks of congealed blood, I don’t like it nor do I want to eat it. I don’t think my friend was concerned about the color (such a bright red and very different than blood in the broth – thanks for the info :)), so much as the octopus (very chewy) and the blood chunks and he really hates fish balls, too. Me, too. 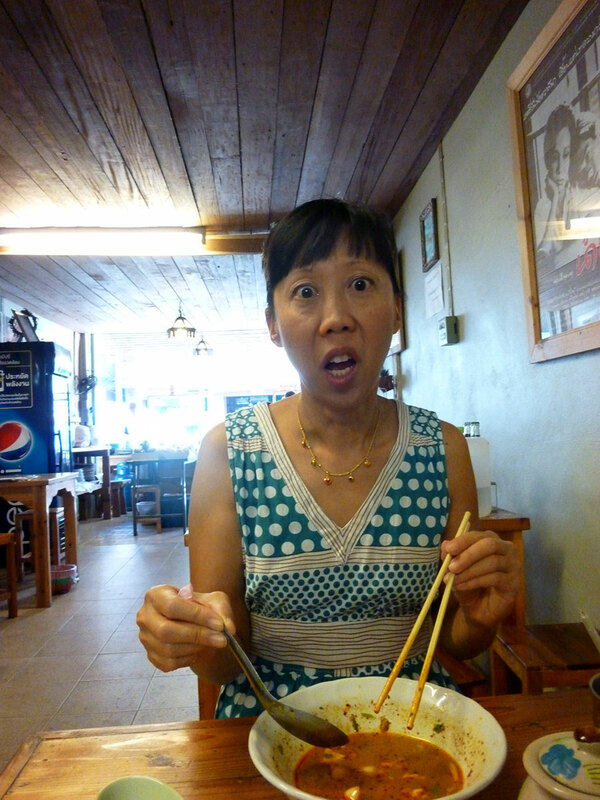 My b/f often is astonished that I’m thinking about what’s for dinner when we just had lunch. I love food and I love to plan ahead, too. And yes, I remember you are a food lover, the first post I read from you was about that yummy breakfast you all had in Phuket. I love food in all its forms. I’ll try most stuff and have always had a healthy relationship with it. However, now I can’t eat like I used to so have been following a bit more of a controlled diet. It’s interesting how we choose to look at food and the impact that has on us, not just as an individual but also culturally. If you haven’t read it, Michael Pollan’s ‘The Omnivore’s Dilemma’ and ‘Cooked’ are excellent mediations on food. Glad you reassured new parents, I truly hope my son isn’t a fussy eater. Although, at the moment the boy will eat everything. Thank you for the recommendations. This post just seemed perfect for the American Thanksgiving holiday and I was surprised by how much could be said about the food we eat. Cheers. I’ve been lucky to have been raised on my mother’s healthy CHinese cooking. Parents’ attitudes and treatment of junk food, was more restrictive. A combination of both seeing it as unhealthy but also poverty prevented parents from buying a case of pop for 6 children. We had junk food occasionally but divided up among 6 of us –box of chocolates, 2 children per pop, 1 large Easter chocolate bunny for all of us. They did not make a big fuss about junk food –which is the right attitude by making junk food less “special” made us less prone to hankering for junk food and simply not buying it quietly for home. I feel incredibly lucky that I’ve learned like all siblings, how to cook some simple healthy CHinese dishes that don’t require intellectual effort and are simple easy cooking methods (to me. ie. steamed meat is easy to do vs. looking complicated to others). My diet is 65% Asian cooking/dishes at home. I eat alot less rice because my body gets hypoglycemic..I don’t feel well. But need to work on desserts. Interesting how you still found yourself learning alot more about Thai cooking/dishes now in Thailand. Thanks for sharing your story, Jean. Talking about how we were raised on food and our attitudes towards it is so interesting to me. I’m sure someone has studied this before, but I wonder if there is a correlation between parents’ attitudes towards food and their children copying them – or rebelling. When I taught 5-7 year olds, I saw some rebelling. 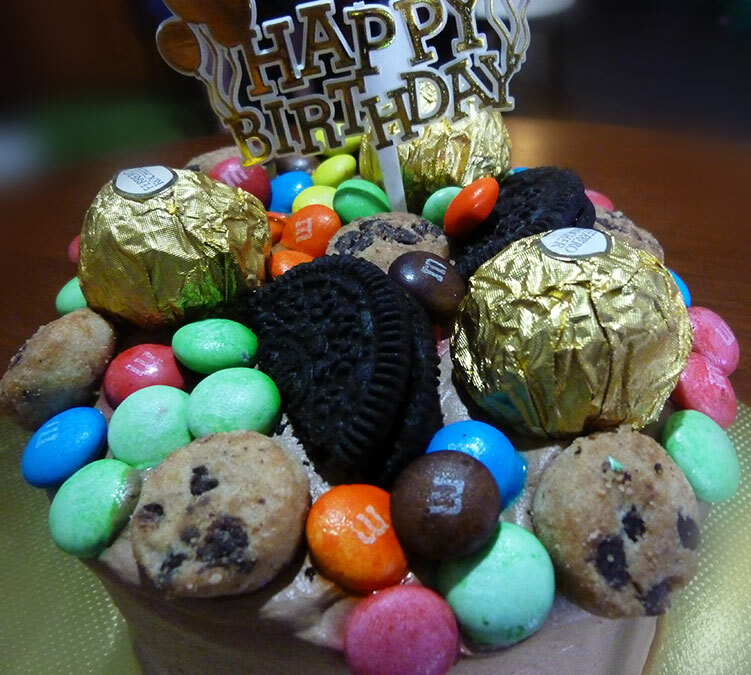 One girl was on a strict sugar-free diet and went NUTS when there were cupcakes or something like that for another student’s birthday. My brother and I will partake in our junk food from time to time, but we certainly do not go crazy for it. It’s almost like it’s no big deal. And because we are educated we are well-aware that moderation is important! When I think back to how I ate in college, I kind of cringe. I used to eat a lot of frozen stuff and Subway. Which isn’t really THAT bad, but I pretty much just eat real food now, with real cheese. I only cautiously tried new stuff when I was abroad because, unfortunately, I’ve always been really picky. It’s definitely a traveling disadvantage. I had my staples and I stuck to them, because food in Busan could be full of seafood (which kind of horrified me). I totally get searching out the familiar – I’d crave burgers like mad in Korea, even though I only ate them like once a year back home. And sometimes, I’d end up at Outback Steakhouse for a salad that didn’t have mayonnaise on it. But Korea really changed my food habits in other ways – I’d end up cooking comfort food for myself, just pasta or chicken and dumplings, and stopped getting frozen or instant stuff (partially because I couldn’t read the directions on some things). I still don’t really do instant or frozen stuff and I’ve imposed that on my boyfriend, who’s still startled by it sometimes. OMG. They put mayo on salad there, too? *shudder* I’ve gotten into the habit of just tossing the creamy white sweet disgusting dressing into the trash. Where do they get this idea from? The British? Yeah, you had the McDonald’s syndrome. My ex- craved food like that and he hardly ate of that kind of stuff back home. Suddenly, it’s like – nostalgic or something. I’m not a fan of seafood either. And when I first saw a seafood pizza at Pizza Hut, I was disgusted. Thais love it though and my students for their pizza party loaded theirs up with ketchup. Blech! It’s a complicated question, our relationship to food, because food is more than food. It is nourishment, power…. Feel free to delete the link after. Don’t mean to PR myself here. But people also use food as a substitute for things they long to find satisfaction in (emotionally, physically, etc). And many are also ignorant of the basic impact of food on their body (can I be honest? I was such a person for most of my life). It is our very life and blood, becomes our essence. When you think of it that way, McD’s loses its appeal a little. Always a poet 🙂 beautifully said. Food is fuel, indeed. Oh man, so interesting and timely. My relationship with food has been rough to say the least. Basically, I’ve been on a diet since I was 12, which was when I started overeating largely in response to dealing with stress, and put on weight. Since then, it’s just been one up/down roller coaster and diet experiment after another. Lately, in the last 4-5 years, I’ve noticed an ability to stop using food to cope. That’s been very healthy, but my relationship is still strained. I’m still unable to know what I need, how much is too much etc. I lack a lot of trust in this department. I’m at a point now where I’m learning how to trust my body again allowing it to go hungry (something I’d seldom do), eat healthy, have junk when I really have a craving but have less of it, etc. It’s the experimental stage of food for me. As a recovering food addict that relationship has been tattered. So much of myself has been wrapped up in it, and it’s been empowering to reclaim those parts of myself back in recent years. But it’s a process ,as is everything. Thanks for your open response. I’m sure stress-eating is very common and it’s a shame we don’t help our kids find another way to deal with life’s problems. Although, I think in the future it will have to be done. It’s an inevitability. Really interesting post! It’s so amazing how food is such a huge part of our lives, and how over the years our habits of eating have changed drastically. I think like you I grew up on American junk food essentials. I used to eat two entire frozen pizzas myself, then bake an instant Betty Crocker cake immediately following and eat at least five slices. I don’t know how I didn’t become severely obese when I was a child–the miracle of a young metabolism. Like you, after I moved abroad (out of the house, actually) I started to cook a lot more and I enjoyed it. I saw it as a good way to bring people together, save money, and to eat healthy. I still try to cook everyday and tackle new cuisine ideas as they come. Cooking is a lot of fun, and I really think more Americans need to get in the kitchen. From fast food to restaurants, I see more eating out here and less home cookin’. Yeah, I’m not sure how many American’s eat at home. I suppose a lot depends on age and location. But I wonder if the Food Network has gotten more people back into the kitchen. I felt healthier in the US, too. The air is better and I ate mostly vegetarian. Sometimes I worry if living abroad (particularly Thailand) ages me. Then again, stress is a big factor and I think Americans are more stressed out.